A mood light works great if you would like to set the tone of a particular room or event to your advantage, but why bother with ordinary mood lights when you can announce your allegiance to the geekiest science fiction franchise ever (according to your opinion, of course), which would be Star Wars. Sure, we’ve seen other Star Wars mood lights in the past, but this one takes the cake surely. We are referring to the £19.99 Death Star Mood Light. It might look like a moon at first glance, but it is no moon for sure! 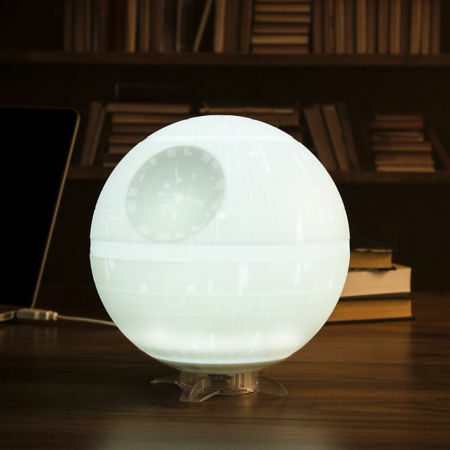 The Death Star Mood Light will do its bit to emit a soothing glow, and we are extremely thankful for that since it is far better than that of having a planet obliterating laser head in one’s direction. It will do its bit to illuminates all of your nighttime antics, and is a whole lot more exciting to have around as opposed to a regular non-battlestation-shaped lamp. Expect this mood light to be USB powered, where it is accompanied by a 1m long micro cable to boot. The only thing about this mood light is, it is unable to float around the room – now that would have been really cool!